Western Buddhism (or Modern Buddhism) is the practice of Buddhism in Europe and the Americas, especially in the United States. For the most part, Western Buddhism is identical to Buddhism in East Asia, borrowing Asian practicises such as the sangha and meditation (although most Asian Buddhist rituals are not borrowed). Usually, practicitioners do not see any reason to create a distinction between the śīla or enlightenment they aim for and the goals of Asian Buddhists. Western Buddhism, however, also has its roots in the Western concepts of freethought and secular humanism, which draws comparisons with Buddhism’s original rebellion from Hinduism rather than its established place as a state religion in many Asian countries today. A feature of Buddhism in the West has been the emergence of groups which, even though they draw on traditional Buddhism, are in fact an attempt at creating a new style of Buddhist practice. Chögyam Trungpa’s Shambhala group is one example, and the Friends of the Western Buddhist Order founded by Sangharakshita is another. There is a general distinction between Buddhism brought to the West by Asian immigrants, which may be Mahayana or a traditional East Asian mix, and Buddhism as practiced by converts, which is often Zen, Pure Land, Indian Vipassana or Tibetan Buddhism. 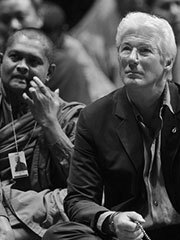 Some Western Buddhists are actually non-denominational and accept teachings from a variety of different sects, which is far less frequent in Asia. Rick Fields, How the Swans came to the Lake, about history of Buddhism in America.